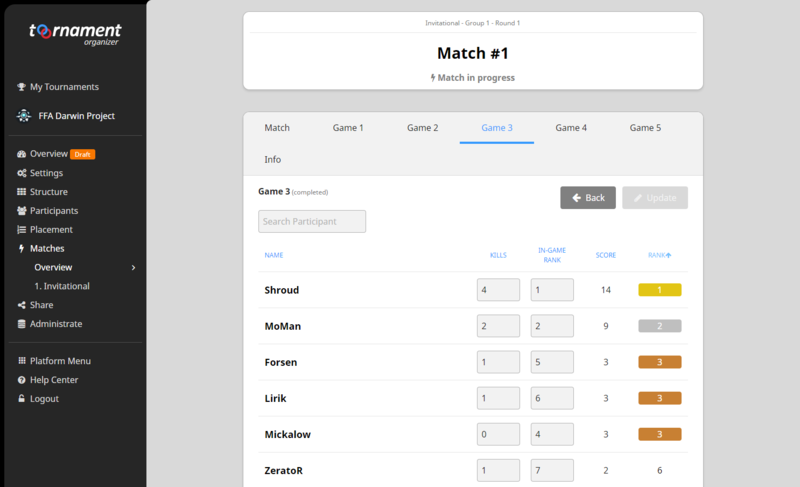 Toornament allows for an easy and complete experience at creating Darwin Project tournaments! Create a new tournament, and select Darwin Project as discipline. If you are not used to it, you may refer to our Starter Guide on how to create your first tournament. With your tournament created, you now need to verify the default settings suit you. Head to "Settings" -> "Match". The Fixed Games (Advanced) format has been customized to follow Darwin Project standard ruleset, which will be applied by default. That's to say the same rules as the ones Scavengers Studio used for their Invitational. You may of course change any or all values to suit your needs. Do not change the options activated by default, as that would change the way calculations work. To welcome the 10 players each Darwin Project match pits, you have to create a FFA Stage, either a Simple Stage or Bracket-type FFA Stage. Go to the Structure menu and create a new one. Name your stage, set it up (follow the above guides if you need help), and carry on! You should open your Registrations to have your participants register to the tournament. Custom Fields are here if you need your participants to give you more information when they register, such as their name or country. Once the tournament is set, it's time to publish it for everyone to see! A whole Share category is available on this Knowledge Base to give you tips and advices on how to promote your tournament. Registered participants then need to get validated, and placed in the stage(s) you created. The Placement process for such stages is pretty simple, and follows the same general rules as any other. 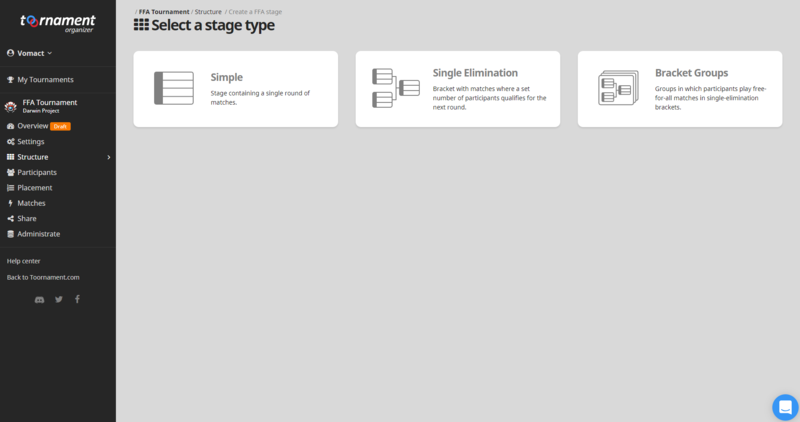 At the end of each game, head to the "Matches" -> "Name of your Simple stage" menu and enter the ranks and kills of your participants. The system will automatically calculate the points earned by players and their ranks based on their in-game rank and kills, thanks to the settings you chose earlier (or the standard ones if you didn't change anything). Here you go, you have a fully functional and awesome Darwin Project tournament! If you wish to create a more complex competition than just a match with games, you could emulate a bracket or anything by creating more stages, and naming them so that people know what it's all about! For those of you who want to improve their video and/or stream production with statistics overlays and results, we have a free and open API! It can also be used to better the organization tools with your own!